Teichner Preserve has 41 acres, includes 200 feet of undeveloped shoreline on Lime Lake and forested wetlands that contain giant elms and chestnuts, rare trees most likely planted by early settlers. The preserve might be small and the trail short — a mere half mile to the lake and back — but the area is blessed with the natural beauty of the wetlands and infused with the passion of those who were so determined to save it. In 1977, Martha Teichner joined CBS News and filed her first story with legendary Walter Cronkite sitting at the anchor desk and since then has reported the news from across the world. The winner of eight Emmy Awards is based in New York City as a correspondent for "CBS Sunday Morning," but the shores of Lime Lake in Leelanau County are always in her heart. Teichner was born in Traverse City and for 10 years lived with her family on the lake's northeast shore in the shadow of Sugar Loaf Mountain, where her father was a ski instructor. In 1996, the news correspondent donated her family’s 20 acres near the lake to the Leelanau Conservancy in memory of her parents and Teichner Preserve was established. Ten years later Teichner was in northern Michigan when she learned that a nine-acre waterfront parcel near the preserve was slated for residential development. Teichner contacted the Leelanau Conservancy, which worked with the landowner to negotiate a purchase price. She then refinanced the mortgage on her New York apartment to finance more than half of the purchase price. It was Teichner's second gift to the conservancy in a decade. Such generosity prompted a neighboring landowner, Jean Raymond, to donate eight acres between the original preserve and the waterfront property. Today, Teichner Preserve has 41 acres, includes 200 feet of undeveloped shoreline on Lime Lake and forested wetlands that contain giant elms and chestnuts, rare trees most likely planted by early settlers. The preserve might be small and the trail short — a mere half mile to the lake and back — but the area is blessed with the natural beauty of the wetlands and infused with the passion of those who were so determined to save it. 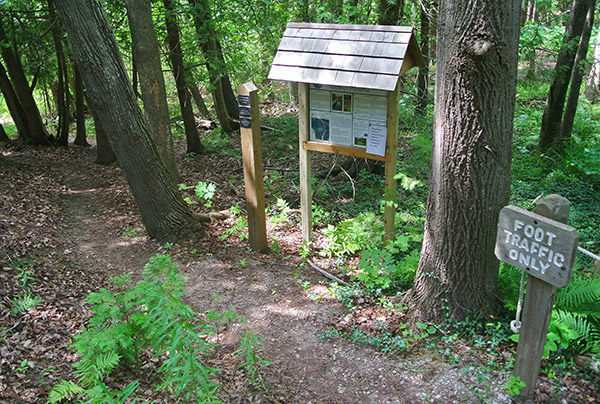 The trail descends from the parking area past an information display to a former road that once extended to the lake. Eventually, the road and its fill pad were removed and the wetland restored to allow its natural flow to again filter the waters of Lime Lake. 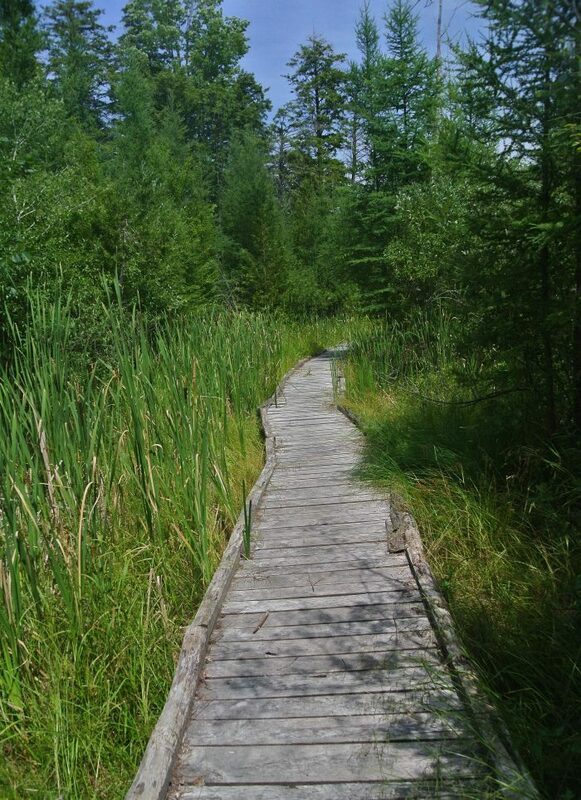 Within 100 yards a boardwalk leads you through the forested wetland that is the heart of Teichner Preserve. 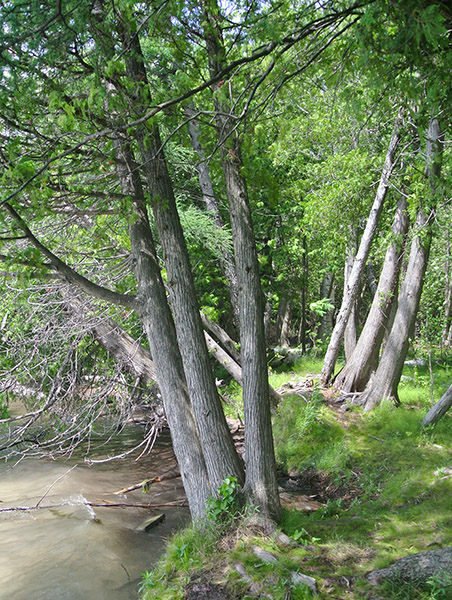 Along with the enormous elm and chestnut trees, the swampy lowlands are home to black ash, ironwood and red maple while white ash and sugar maple grow in surrounding upland areas. Observant hikers might also spot several rare species of ferns, including rattlesnake, interrupted, and maindenhair. Blue flag iris can be spotted in the marsh while the most common wildlife encountered are woodcock, grouse and wild turkeys. The boardwalk gives way to a foot path that quickly leads to a bench in a tangle of tamarack and cedar near the shoreline. In the fall, the tamarack’s needles turn a golden yellow to blend in beautifully with the colors of the surrounding hardwoods. The view of Lime Lake from the bench is worthy of a long break even though you’ve hiked less than a quarter mile. Backtrack the boardwalk to return to the trailhead. There are no facilities at the Teichner Preserve trailhead other than parking for a handful of vehicles. Teichner Preserve is open year-round. There are no fees for enjoying the trails. From Leland, head south on M-22 for 9.5 miles and turn left on Lime Lake Road. Within a mile is the posted trailhead of Teichner Preserve on the west side of Lime Lake Road. For more information contact the Leelanau Conservancy (231-256-9669). The conservancy also has an office in Leland at 105 North First St. that is open Monday through Friday from 8:30 a.m. to 5 p.m.